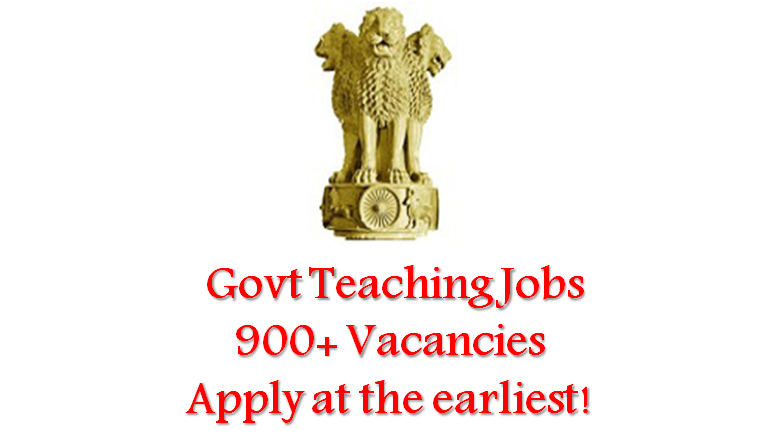 Good news for teaching job aspirants as more than 900 vacancies are open for recruitment. This will be a great opportunity for govt job aspirants as now they have more options before them. Considered to be one of the most sought after job options among graduates, teaching job has its own share in job market as well. Being a teacher helps you gain respect and status, different from other job sectors. Why should you apply for teaching jobs? It is because as a teacher you will be involved in moulding the future of the country, both passively and actively. Proper education is a treasure for the nation and teachers are the keys to it. In addition to this, being a teacher gives you all the best things you deserve starting from salary till perks and allowances. Not to forget holidays as well! What more do you need from a job that pays you well and gives you a peace of mind also? Who can apply for teaching jobs? Of all the vacancies that are active for recruitment, majority seek applications from graduates. However candidates are suggested to go through the official notifications of each of these before applying as eligibility criteria varies for each of the posts. Candidates should take care of the last date for submission of applications properly. Submissions after the last date will not be accepted by the recruiting organizations. Details of the vacancies can be found from below.